In a previous post we have explored the idea of solving problems by projecting them on state spaces and then using a search algorithm to find the solution. Usually, we will work with problems that look for solutions as sequences of actions that transform initial states, that are not solutions of the problem, into final states, that are solutions of the problem. In that post we presented a very simple algorithm called Breath First Search (BFS) providing a sorted way of browsing the space of states in a blind way. For this reason, although the algorithm returns an optimal sequence of actions that reachs the solution (in the sense that it has the minimum number of actions), in the process to build this sequence the algorithm can perform a huge number of steps (and, consequently, spend a huge number of time to reach the solution). If all the information we have about the state space is local, that is, we only know how to reach new states from previous ones by direct application of transitions, BFS algorithm (or similar ones) is the best we can do... we have no knowledge about the space, and we make a blind search. But if we would have any global information about the structure of the space, maybe we could take decisions of the correct direction to go faster form the initial state to the solution. In this case we say that we make an informed search. When we are looking for a "short" path connecting the starting point and the solution, we count how many transitions have been applied in the path (the length of the path), but in other more general cases we need some way to measure the cost of the different options to choose the best one. The ideal situation is that we can manage a complete information about the best way to reach the solution, but in almost every interesting case all we can get is an intuition/approximation about how much cost to reach the goal. In these cases, we say to be working with an heuristic: a practical method not guaranteed to be optimal or perfect, but sufficient for the immediate goals. The idea behind a heuristic search is that we explore the node that is most likely to be nearest to a goal state. To do this we use a heuristic function which tells us how close we are to a goal state. There is no guarantee this heuristic function will return a particular state that is closer to a goal state than any other one. If we could do that we would not need to be doing a search. We would simply be moving through the various states computed by the heuristic in order to reach the goal state from the starting one. It is important having in mind that the heuristic function tries to estimate how far we are from the goal state, not the cost of the solution under construction. To implement a heuristic function we need to have some knowledge about the domain, since it needs to have information about the problem in order to judge how close the current state is to the goal. 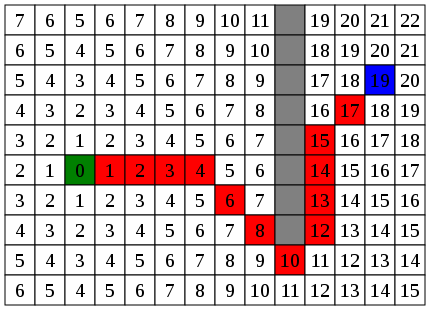 Among the different search algorithms that make use of partial information by using heuristics, the most famous is the A* algorithm, and in this post we will present several implementations of this algorithm in NetLogo, from a basic application of A* to be used as a pathfinding algorithm in 2D grids to a more general version where we give some reports to be used as a General Problem Solver. where \(g(s)\) provides the cost of the path from the start state to current state, \(s\), and \(h(s)\) estimates the cost of the cheapest path from the current node to the goal. And the best of all, this strategy can be proved to be optimal and complete, under simple restrictions on \(h\) (it must be an admisible heuristic, optimistic, that is, it must never overestimate the real cost to reach the goal). In this first implementation we will only make use of patches as agents that controls the execution of the algorithm. The model where A* will be applied consists on a 2D grid of patches where some of them represent walls that we can't cross. Final-Cost will store the cost of the path returned by the algorithm. active?, a boolean that says if the patch is active in the search process, that is, if it has been reached, but its children have not been explored yet. and the second one is the expected cost that the heuristic provides from this patch to the goal. This cost will be the key to decide how to build an efficient path. The first part is determined by the partial path to reach the patch, and the second one reflects our knowledge about the global information we can infer from the world. It measures how much left to reach the goal from here... the better this heuristic, the faster we will find the shorter path. The heuristic report is something that must be adapted for every problem. In this case, as we are trying to find the shortest path, it makes sense if we take the heuristic to be the euclidean distance to the goal (that NetLogo language provides). #Start : starting point of the search. #Goal : the goal to reach. #valid-map : set of agents (patches) valid to visit. ; exists? indicates if in some instant of the search there are no options to continue. ;   bound big enough to be sure that the new path will always be smaller. In order to test the algorithm we prepare one procedure that will take a sequence of random patches to compute the shorter paths that connect them (if possible). After every path is calculated, we use the drawer turtle (see above) to highlight the path. After having presented the A* for pathfinding on 2D grids (in fact, it works the same for any dimension if you consider the neighbours patches in that high dimensional space) we will present how to use the same ideas to find shortest paths in any kind of network (not only grids). for example, think on a road network or a street map of a city. In this case, we will suppose that we have a network (a set of nodes connected by links), and given a start and a final node, our goal is to find a shortest path in the network connecting them. Since we are looking for pathfinding on networks, the cost of moving from one node to one of its neighbors will be the length of the link between them. Although an implementation of A* can be made by using only the nodes of the network, we will give a version where one more breed of agents is used to perform the search on the network. We don't need any extra property in the nodes. All the information will be stored in the searchers, and to know if a node has been explored it is enough to see if there is a searcher on it. Nevertheless, searchers will have some additional properties for their functioning. The setup procedure simply create the geometric network based on the number of random located nodes and the maximum radius to connect two any nodes of the network (two nodes are connected if the distance between them is less or equal to the radius). As in the previous case, we need to define the heuristic function that reports an estimation of the cost form the current node to the final one. Again, because we are looking for a shortest path, a good option for the heuristic can be the distance from the location of the searcher and the goal. You can try with different heuristics to study how this estimation affects the behaviour of the algorithm. The A* Algorithm for networks is very similar to the previous one (patches). Since it is supposed that the network is accesible by the algorithm, we don't need to pass it as input. Therefore, it will only receive the initial and final nodes. ;   length link, we can stop as soon as we reach the goal in the first time. ; Maybe in this node there are other searchers (comming from other nodes). ;   report that you can find bellow. The searcher-in-loc report is an auxiliary node report to return the searchers located in it (it is like a version of turtles-here, but for the network). Together with the main procedure, we can write some more auxiliary reports and procedures to make visible how to use it. Some of them are in charge of highlight the path when it is found (take into account that the path is stored as a list of nodes, but we could make it by storing the links in between, or both). Its functioning is very similar to the one we used for the BFS. In the previous sections we have used A* in the most usual way, as a pathfinding algorithm for physical environments (in fact, for a long time it has been the most used method for pathfinding in videogames). Now, we will use it in a more general form, as a General Problem Solver as we did with BFS. For that, remember that we need to project our problem as a search in a suitable state space where finding a solution is transformed in searching a path (a "good" one, preferably) that says how to go from an initial state to a final state. As we mention above, we can use A*-like algorithm when we can get some global information about the searching space and, consequently, we can redirect the search based on some heuristic that measures the fitness of each option. In the previous cases, where a "geometrical shortest" path was intended, this heuristic was usually related with the geometrical distance between the state and the goal (we have used the euclidean distance, but other distances or variants can be equally suitable). In a more general search, where maybe there is no vector space behind the problem, one so direct heuristic could be unknown, and we must try with different options until we get good results (in a heuristic way, quite literally). Later, we will explore how good or bad heuristics can affect dramatically the performance of this algorithm. And we need one property in the states to store its content (the information related with the problem to be solved). Although it is possible to give an A* implementation by using only one breed (searchers and states in a common breed) we have preferred to maintain the state space and the searchers agents in different layers, in order to give a clearer distinction of their functionalities. If we had have all the state space projected as a network (states as nodes, and transitions as links) we could use (almost) directly the previous version of A*, but usually the state space is too big to prebuild the associated network. For this reason, the essential change we introduce will be the dynamical construction of the states network as the algorithm will need it. That is the reason we will use the same reports for transitions, children-states, final-state?, ... that were introduced in the BFS post. We will only note on the main changes of the code. The whole commented code can be seen in the model. The links of the network will store the applied rule between states and the cost of the application. Usually, our goal is to minimize the total cost of the sequence of transformations to reach the solution from the starting point. To focus in the main ideas of the algorithm we will use the same numerical problem as in the BFS post (reach a number from an initial one by using only some permitted operations). In this way, the auxiliary functions to manage the states and transitions will be (almost) the same. and "representation" is a string to identify the rule. Children-states is a state report that returns the children for the current state. It will return a list of pairs [ns tran], where ns is the content of the children state (new state), and tran is the applicable transition to get it. It maps the applicable transitions on the current content, and then filters those states that are valid. Final-state? is a state report that identifies the final states for the problem. In this case, it will simply compare the content with the goal (that is passed as parameter). All the previous procedures must be changed to adapt the algorithm to other problems and state spaces, but it is supposed that the main A* algorithm have not to be touched. Remember that the main difference with the previous versions will be that we must dynamically create the state network on-the-fly, as soon as we need it to explore it. One more main difference will be in the main loop. In the previous cases, because we are working with an euclidean (or equivalent) distance to get the "shortest" path, we could stop the search as soon as the first searcher found it. Now, because the space is general, there is no relation between the connected states and the "distance" between them. That is, it is possible that paths exist longer in step applications (with more nodes) but shorter in cost than the direct link, as the following figure shows: state 2 can be reached directly from state 0 directly, with a cost of 10; or by crossing state 1 with a total cost of 2. For this, reaching the goal in less steps is not a guarantee of lower-cost path, and we will have to continue the searching of other paths after reaching the goal. Only after checking that all the possible paths starting from the initial state are worse than the one we have reached, we can stop the algorithm. Sometimes (for example, in games that need real time response) we don't need the best solution, but only a good one obtained in a faster way. In this cases, we can stop in a "good enough" path, and not to wait for the best one. ;   that creates an initial state and put a searcher in it. The procedure to create dynamically the neighbors of a state s takes the children-states of s and creates a new node of the network for each one of them (if the states has been previously created, then it only connects them). In the link to connect the nodes it stores the rule that transforms one in the other. Finally, we provide a procedure to test the A* algorithm between two numbers (they correspond to slider-controls in the interface of the model). It results that A* works worse then BFS... How is this possible if it is supposed to work with more information about the search space? Well, one thing is to have information and one other thing is to use it in a correct way. Let's see how A* behaves when we change the heuristic. Note that sometimes the searchers are duplicated because we create a new one in an already visited node, that's the reason we show the number of states that the algorithms produce too. In this problem, looking only at how far we are from the goal is not so realistic. Maybe when we are far away it gives some idea, but in short distances it gives wrong results. For example, 9 is reachable from 2 by using one only operation (+7) and the distance between 2 and 9 is 7, nevertheless the distance form 2 to 3 is only 1, but you need more operations to reach it. The previous comparison shows that h2 is better than h1 (at least for this example), but it is far away from the BFS... could you think in one different heuristic that guides the search in a more efficient way? Independently if you get it or not, this example shows that A* is good enough only if you have a clever way to use the global information of the space, but not otherwise, and this "cleverness" comes from a very good understanding of the problem and its context. Let's provide now one problem where we can easily define a heuristic that works better than the blind search. In this case we will try to give the minimal number of transpositions to sort a numerical list. Let's start with some definitions about the problem. If we have a list, the problem is to sort the list in an efficient way by using only transpositions.